← Conveyor Choices—Drag, Belt or Pneumatic? Manufacturers often choose continuous bucket elevators because these machines seem like the obvious choice. Manufacturers need to handle material gently, they need to move materially vertically; they have limited space to do so; they need to move material quickly; and they’re using a belt conveyor to move product. A bucket elevator will accomplish these things. But it will do so with major drawbacks. While buckets may seem like the only choice, there are other options that meet manufacturers’ material handling needs. But before discussing those options, let’s dig further into why manufacturers resort to continuous bucket elevators. Out of the reasons why manufacturers choose continuous bucket elevators, their use of a belt conveyor typically drives their choice. But belt conveyors are notoriously bad at elevating product. They can only angle up 15 or 16 degrees before product begins rolling back down the belt. Thus, when manufacturers have to elevate product, they either have to use a long conveyor that takes up lots of floorspace (which is neither economical nor fast) or install some type of elevating equipment, such as bucket elevators. There are two types of bucket elevators: centrifugal and continuous. Centrifugal elevators are commonly used to move grains and other non-fragile materials that weight up to 50lb/sq. ft. With these elevators, buckets dig into a pile of grain and throw the grain at the top of the elevator. Continuous bucket conveyors don’t dig material. The material is conveyed to the bucket elevator and is gravity fed into the buckets, which are commonly attached to a belt. 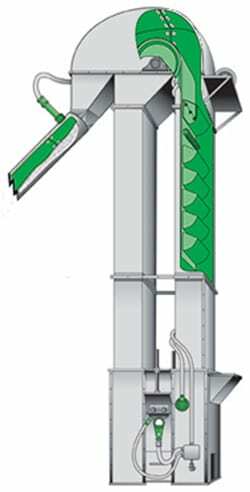 The buckets elevate the product and discharge the product using gravity on the descending side of the elevator. As said, bucket elevators come with a set of problems. Simply put, they can be a maintenance (and production) nightmare. They’re complex. They use motors which need maintained. They increase energy costs. They increase the number of gears and parts to keep track of and replace. They’re hard to clean, difficult to get aligned and flowing at the correct speeds require tensioning, and on and on. For a detailed analysis of how to diagnose problems from bucket wear, click here. There are a lot of little things that can go wrong and, when not caught early, can quickly lead to big problems. Manufacturers who use bucket elevators rely on plastic buckets bolted onto rubber belting. As the machines collect material and elevate it, a lot of force is placed on those bolts. If these bolts begin to fail and maintenance doesn’t catch it, the buckets can rip off the belt and do a lot of damage—and a lot of downtime. Another small issue is belt tracking. If the belt gets off track a little bit, the belt and the buckets can begin to wear. As the belt wears, it loses its integrity. As the buckets wear, they don’t hold material as well. This leads to excess material falling into the bottom of the bucket elevator, which manufacturers either have to discard (waste) or manually feed shovel back into the system (a waste of time). Even when buckets aren’t worn, elevators are messy. Piles of material form under the elevator’s conveyor, and material collects around the buckets and between belt sections. Bucket elevators are also difficult to protect in terms of fire and explosion proofing. Jams are one of the most common problems with bucket elevators. Moving products can interlock or catch on the equipment frame, causing it to freeze. The production line must then be shut down and the elevator opened and the jammed material removed before production can continue. Jams can also occur when material builds up inside the bucket elevator shell or housing and eventually clogs the machine. We once had a client who opted for a bucket elevator. The result? Maintenance problems galore, and in less than a year, their elevator was toast. We’ve had conveyors run for years with only routine maintenance performed. Our wear strips rarely need replaced, even on curves. Typically, all maintenance crews have to do to our conveyors is lubricate them. Floor Space? Not a problem. Elevating materials at steep angles isn’t a problem for our conveyors. The conveyors can elevate materials at angles up to vertical—with minimal support structure required. This means that valuable floor space won’t be taken up. Drag conveyors also eliminate the mess associated with bucket elevators. There won’t be anything to clean up on the floor or in the conveyor itself. Also, because our conveyors are enclosed, we can make them dust tight. This eliminates debris in the air which workers must breathe, and it makes the conveyor better from a safety point of view, as it’s easier to prevent and contain fires. Drag conveyors also handle material gently. Our paddles are designed with “fingers” that rake the product and keep it from packing together, so it runs smooth through our machine and doesn’t get crushed. It’s no rougher than transferring the material and dumping it. And unlike an auger/screw conveyor, it also won’t chop up or otherwise decompose material. Material also won’t face the constant, harsh grinding from a center-line chain in our conveyor. We use dual chains to pull the paddles through our system that are placed on the conveyor sides outside the path of the material. 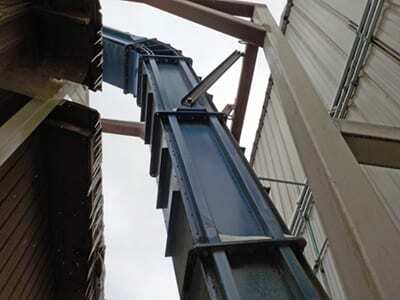 Drag conveyors are far superior to bucket elevators for elevating material. If you’re tired of your bucket system or are simply weighing your options for material handling, give us a call. Find out for yourself the meaning of our slogan: Superior Engineering. Superior Performance. Click here to receive an email with more information about our conveyor! This article was posted in General and tagged bucket elevator, chain conveyor, drag conveyor, en-masse conveyor, grain elevator, material handling, paddle conveyor, twin chain conveyor. Bookmark the permalink. Follow comments with the RSS feed for this post.Post a Comment or leave a trackback: Trackback URL.